The next generation fan convector offering energy efficiency, safety with its low surface temperature casing and controllability with in-built room thermostat. Suitable for use on both existing boiler systems and those driven by renewable technology such as ground or air-source heat pumps. 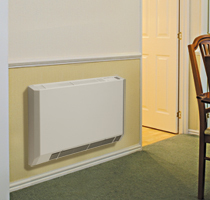 Using only 5% of the water content of an equivalent output radiator the Ecovector low level fan convector is fast, responsive and very quiet in operation. Provides warmth from the floor upwards – the ideal heating pattern – but is more responsive, energy efficient and effective than either under-floor heating or radiators. Will heat the room more quickly than other heat emitters thereby reducing the amount of time your boiler or heat pump is running.